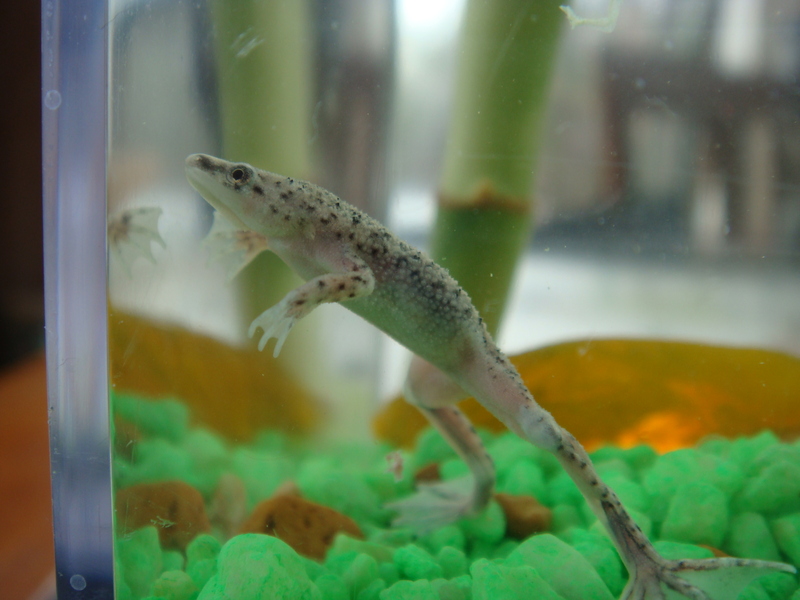 Meet the two newest additions to our household… Ribbit and Rogget. Two little African Dwarf Frogs… also known as Aquatic Dwarf Frogs. They came as part of a Wild Creations EcoAquarium. Believe it or not, I found this at our local Hallmark Store in West Roxbury for $29.95. For that price you get the EcoAquarium, 2 frogs, 1 snail (named Jim) and a small bamboo plant. Supposedly, the only maintenance you have to do is feed the frogs (two pellets each) two times a week and then change out half the water every 5 or 6 months! You may need to replace all the water and clean the tank contents every so often… but not more than once a year. 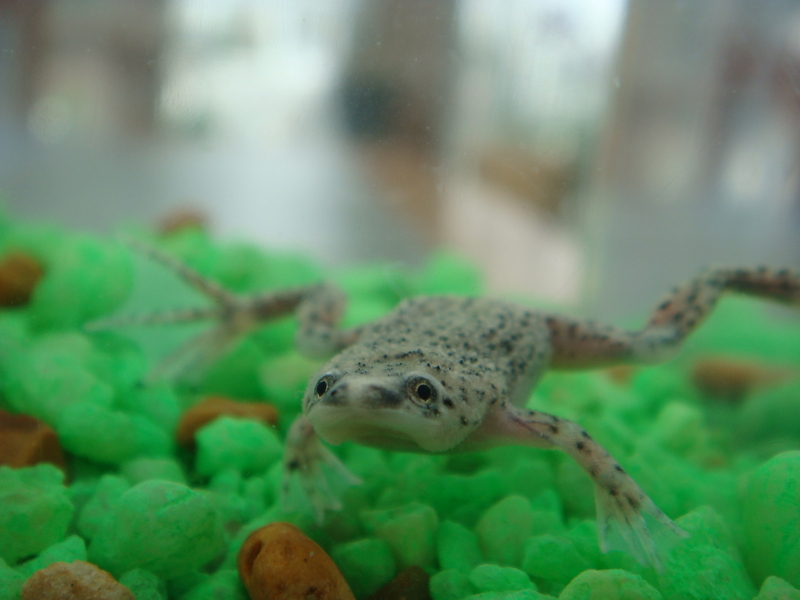 As the name suggests, these dwarf frogs are quite small, just around 1.5 inches in length. The females, as is often the case with frogs, can grow a bit larger, almost by half an inch. 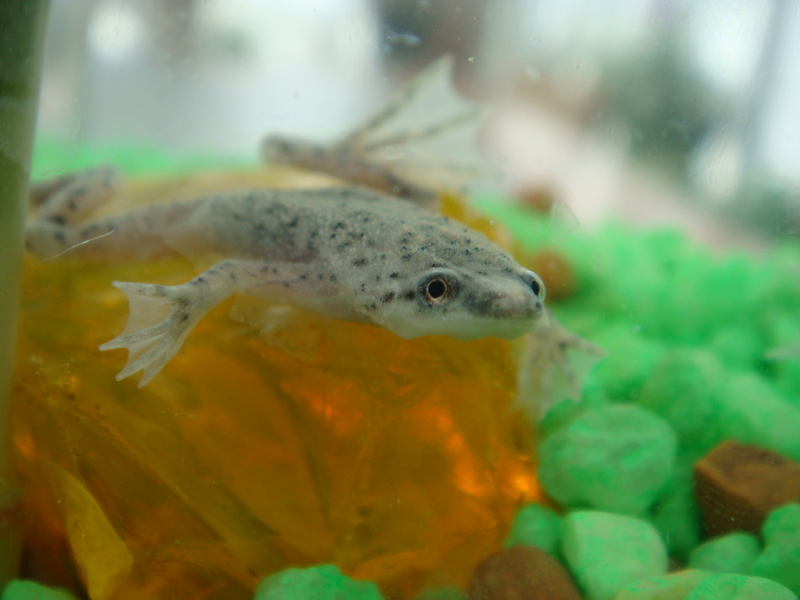 Native to Sub-Saharan Africa, the African Dwarf Frog (Hymenochiru) also goes by the name of Aquatic Dwarf Frog. And that’s because they live almost entirely underwater, though they are air breathers as well and do emerge from the water from time to time. 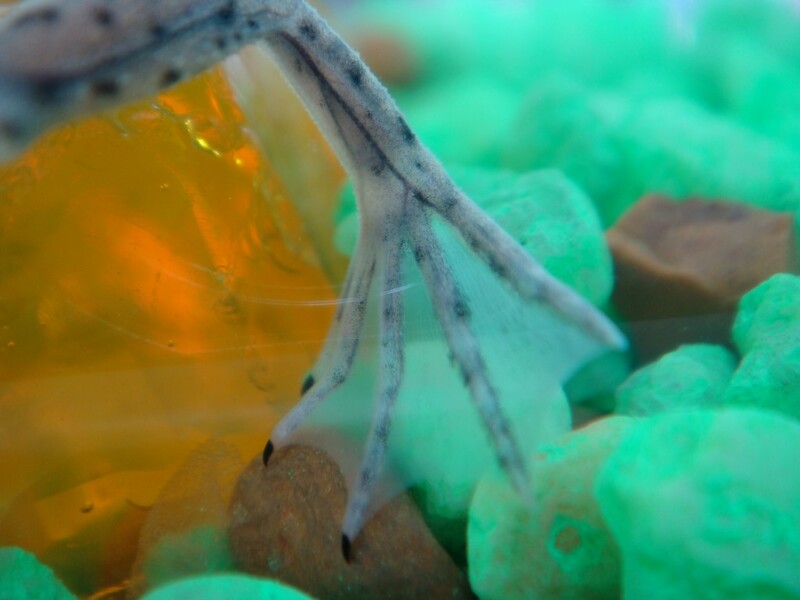 The coolest thing about the African Dwarf is their weird floating habit when in the water called the “Zen position.” With arms and legs outstretched and one foot balancing, it’s as if these frogs are meditating on some sublime aspect of amphibious life. Or just reminiscing their previous life as a prince. 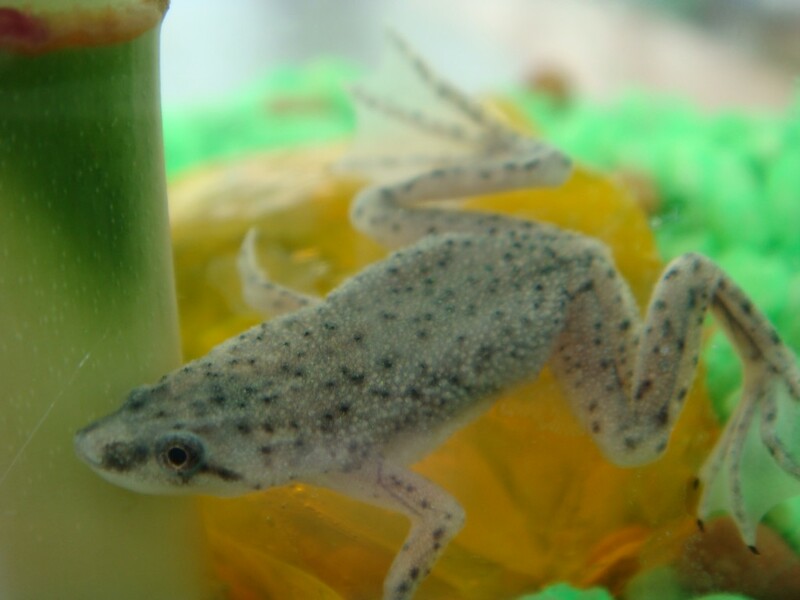 Technically, this habit is called “burbling.” Whatever that means, Dwarf Frogs make for interesting addition to your amphibious pet collection at home. They spice up the variety of species one can put in any tank aquarium. As social creatures they can be tank mates to some marine animals. The literature also suggests that they can live to be 2 to 4 years in age if taken care of properly. And just look how tiny there little toe nails are! You can actually buy this little guys online at the website I provided earlier. The company is located in Myrtle Beach, NC and was started by two friends — now it’s 30 people large. They have links for teachers and for illustrating their “green values”. Living elements inside an Eco-aquarium contribute to the the needs of each other. Our Frogs & Snails inhale oxygen & exhale carbon monoxide. The living plants & algae take in carbon monoxide and expel oxygen through photosynthesis, and the natural bacteria in the living gravel convert ammonia from animal waste into nitrites providing food for the living plants. Each element relying on the other. The balance is maintained through careful matching of plants, bacteria, & animals in each Eco-Aquarium. Given ideal lighting, and an even, warm environment, a balanced Eco-system can be sustained with very little outside maintenance. They are committed to the animals and you can read more here about the special care they take to ensure each animal is properly cared for.